Workpiece in process on the Kitamura 800iLTGA Heavy Duty HMC. A completed clam cutter. Wagner Machinery manufactures 80% of the component parts which are sent to H & S Tool, Inc. for assembly. Finished workpiece, a clam cutter, when it leaves the 800iLTGA. The clam cutter is 30" in diameter. Wagner Machine, Inc. actively seeks out ways to stay competitive in the manufacturing industry. The company recognized that in order to remain flexible it would need to update its current technology and improve its throughput. The precision custom components manufactured at Wagner Machine change from day to day. 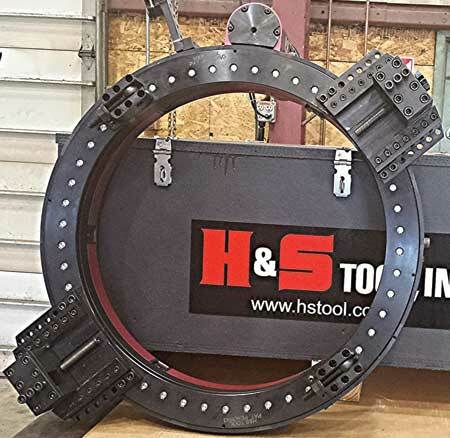 The company uses a 1995 horizontal machine tool with a 36" cube work space and a horizontal boring mill for the largest components. 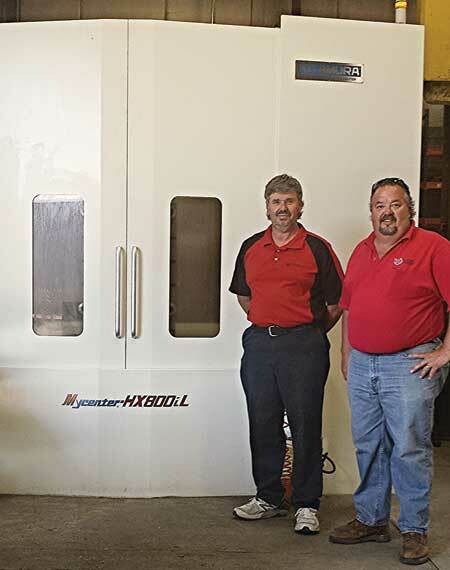 The company needed an additional machining center for mid-range machining. Criteria included speed, efficiency and precision, as well as rigidity and heavy cutting capabilities. The company considered updating its old equipment, but decided instead to invest in new CNC technology. The Kitamura 800iLTGA Heavy Duty HMC was chosen for its high precision and high performance capabilities, and was purchased from Tipton Machinery, Kitamura’s Northern Ohio distributor. The 800iLTGA is constructed of Meehanite cast iron and features induction hardened, precision ground solid boxways to provide enhanced accuracy in tough cutting conditions. According to Kitamura, it offers consistent accuracies of ±0.002 mm (±0.000079") full stroke and ±0.001 mm (±0.000039") repeatability. Patented twin ballscrews on all axes are driven by twin servo motors to provide 50 m/min (1,969 IPM) rapid feedrates. The Ballscrew Cooling System is designed to optimize thermal stability and reduce machine warm-up time. Kitamura’s Intelligent Advanced Control (IAC) System further compensates for thermal displacement through a combination of regulating sensors and a machine efficiency monitor. The high-torque, 8,000 RPM 4-Step Gear Driven Spindle is designed to provide high-efficiency cutting performance with low energy consumption. The 800iLTGA features XYZ travels of 1,400 mm (55.11") x 1,250 mm (49.21") x 1,325 mm (52.16") and B-axis (rotary table) travel is 0 – 360°. Maximum workpiece size 1,500 mm (59.1") x 1,500 mm (59.1"); maximum table load 2,000 kg (4,400 lbs). "The Kitamura 800iLTGA is much more efficient than our older equipment," said Courtney Wagner, CFO, Wagner Machine. 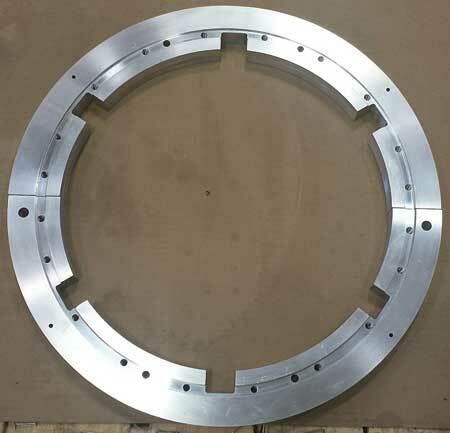 "One item that we have been running on the Kitamura is a 30 inch diameter clam cutter for the pipeline business. The Kitamura has enabled us to run production jobs of over 100 pieces. The spindle speed, tool change time and rapid travels provide us with much faster machining capabilities. Additionally, the Kitamura has freed up our other machines for larger items." The Kitamura has also allowed them to use different alloys, including 4140 and 4150. According to Ms. Wagner, the 800iLTGA performs faster and achieves greater depth of cut than previous machining capabilities provided. Ms. Wagner cites the local distributor support provided by Tipton Machinery as a big part of the purchase decision. Tipton has seven technicians in Northern Ohio, where Wagner Machine is located. According to Ms. Wagner, an entrepreneurial spirit and manufacturing know-how were passed down in this family-owned company. "My great-grandfather owned Century Cycle in Akron circa 1910 and built motorcycles by hand," she said. "My grandfather retired from Babcock & Wilcox Co. as a machinist, and then started Wagner Machine from his garage with the help of his wife and his seven children. My father and uncle were raised in the environment and I was running a band saw in the summer starting at age 14. My father always told me that I was only allowed to work with him if I learned the basic knowledge of machining. So, when I was 19, I took a break from college and went to machine trade school." Wagner Machine specializes in both small and large parts, repair parts, prototypes and R&D projects. Wagner Machine is ISO 9001:2008 certified and serves a variety of industries, including automotive and energy.